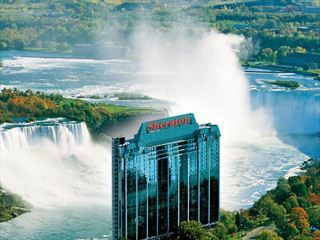 Those looking for a spectacular view of Niagara Falls and an upscale stay may find no better place to stay than the Marriott Niagara Falls Fallsview hotel. 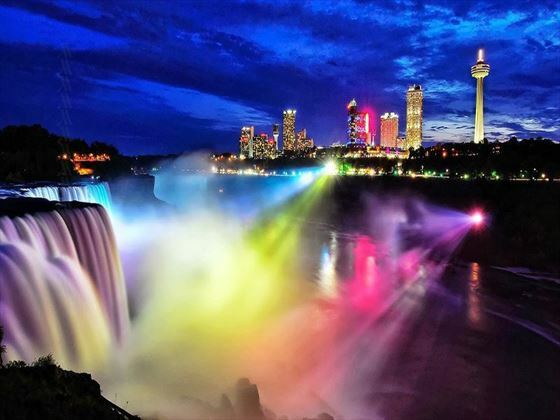 While there are lots of hotels in the area with vistas of the falls, the views from here are absolutely jaw-dropping, with each and every room overlooking either the falls or the Niagara River. 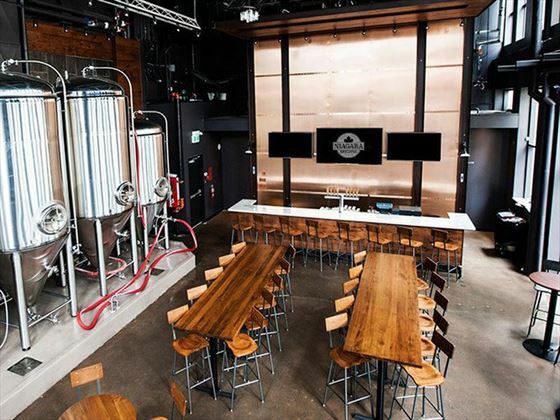 It’s just a half-mile from the popular Maid of the Mist boat tours, and the Clifton Hill entertainment district, providing easy access to all sorts of fun, plus the Fallsview Casino is connected by skywalk if you want to try your luck at gambling. Look forward to relaxation by indulging in a wide range of treatments at the onsite Serenity Spa By the Falls, or soaking in the whirlpool. 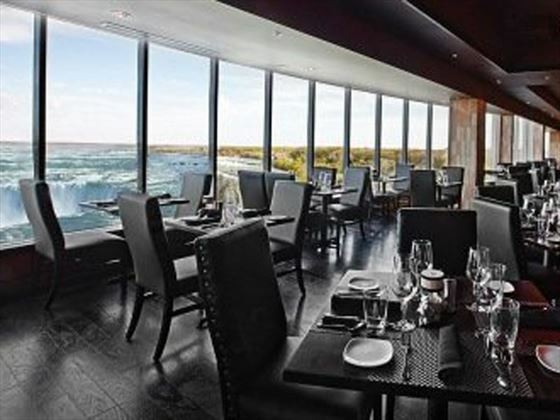 There are multiple dining options too, including Morton’s Grille Niagara Falls, offering another stunning view of the falls along with delicious meals. Riverview Guest Room – These 310-square-foot rooms offer a view of the river and include either two queen-sized beds or one king-size bed, and all standard amenities. Fallsview Guest Room – The Fallsview Guest Rooms have 360 square feet of space and include two queen-sized beds as well as a view of the Falls, including American Falls, Bridal Veil Falls and the Canadian Horseshoe Falls, along with all standard amenities. Superior Fallsview Guest Room, 2 Queen – These 360-square-foot rooms feature two queen-size beds, all standard amenities, and offer a panoramic view of the Canadian and American Falls. Fallsview Guest Room, 1 King Whirlpool – The room has 360 square feet of space and includes one king-size bed, a large 2-person whirlpool and an impressive view the Canadian and American Falls, along with all standard amenities. Superior Fallsview Guest Room, 1 King Whirlpool – These 360-square-feet rooms are located on a higher view for exceptional views of Canadian and American Falls. 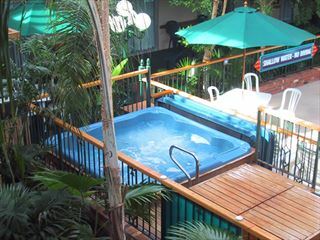 They include one king-size bed, a large 2-person whirlpool and all standard amenities. Executive Fallsview Guest Room – The Executive Fallsview Guest Rooms have 430 square feet of space and a stunning view of the falls. They include a room with two queen-sized beds and a second room separated by French doors that open into a sitting area with a pullout sofa, as well as all standard amenities. Junior Suite – The 440-square-foot Junior Suites are two-room suites that boast an impressive view of Canadian and American Falls. One room includes a king-sized bed and a large, 2-person whirlpool, while the other features French doors that open into a sitting area. All standard amenities are included as well. Fallsview Bi-Level Loft – The 675-square-foot Fallsview Bi-Level Lofts sleep up to 5 guests and are 2-storey suites that feature floor-to-ceiling windows. They include a living room with a seating area and mini-bar on the main floor, as well as a whirlpool and all standard amenities. 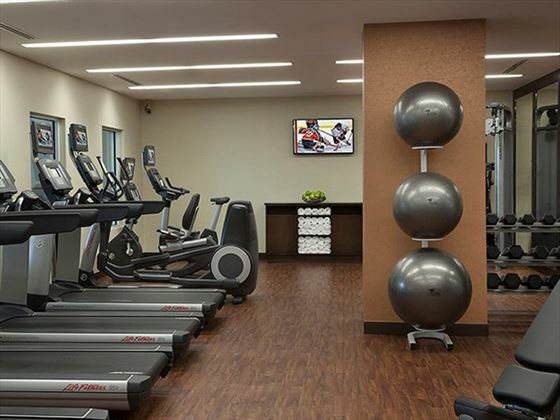 Family Connector Room – This room is the largest in the hotel, with 700 square feet of space across two separate hotel rooms. 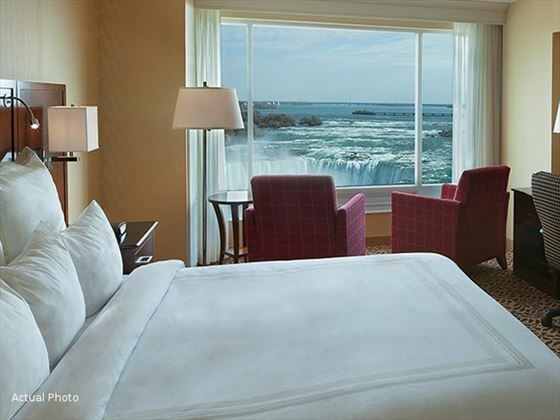 The main room includes two queen-sized beds and offers a view of Canadian and American Falls, while the second room has one king-sized bed and a view of the upper Niagara River. 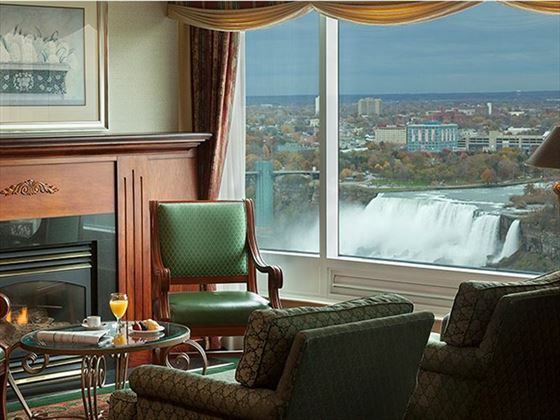 Grand Niagara Suite – The impressive Grand Niagara Suite is the property’s most spectacular guest room, set on the 23rd floor for incredible views of American Falls and Horseshoe Falls, and featuring a mahogany king-size bed as well as a whirlpool and all standard amenities. The hotel offers a number of dining options, including Morton's Grille Niagara Falls, with a menu focused on steaks, seafood, burgers and local cuisine. The Marriott Breakfast Buffet is served every morning, while the Lobby Lounge offers a great place to catch the game and enjoy a drink along with casual fare. A Niagara Falls Starbucks Café is also hosted onsite. A limited menu is also available for room service. 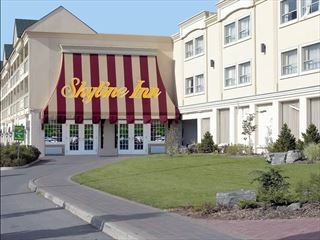 The hotel is located in the Fallsview District, just a little over 100 yards from the edge of Niagara Falls.